Stylish Bluetooth speaker which offers high definition stereo sound and is compatible with all mobile devices that support Bluetooth. It has a wireless connectivity range of over 10 metres and can also be used with an audio cable. Playing time is 3-4 hours and it is easily recharged from a laptop, a power bank or a USB mains adapter. It has a microphone for phone calls and music can be played and paused or tracks switched directly from the speaker. Polaris is presented in a gift box with a Micro-B USB cable, an audio cable and an instruction leaflet. It laser engraves to an oxidised white colour. Colours: Silver, Red, Blue, Black. Dimension: Speaker: Dia 57mm x H 57mm. 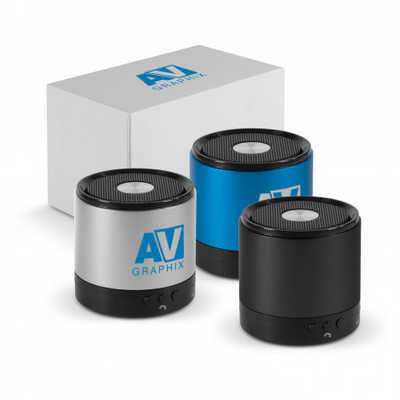 Print Description: Speaker - 35mm x 25mm. Print Type: Pad Print. Packing: Gift box. Price includes : 1 Col 1 Pos Print. Setup is included.